Oh fall, you are my favorite season. Because it always fall in San Francisco. I am prepared for you. My closet is prepared for you. My body loves your cuddly layers and predictable 5 - 10 degree temperature variable. And so, the question becomes, how to dress for fall? In a city where it ALWAYS fall, I feel qualified to answer this question. It all starts with the essentials: grey skinnies and a white silk pocket blouse. Part of the reason I own such an extensive collection of moto jackets is that it is quite possibly the only thing I own that is truly all-season, (remember when I visited summer and wore my white moto worn with cutoffs) but fall is where this jacket really shines. If you don't own a white moto you really should. Now that Gap makes black leather jackets, the white leather moto is the new way to be "rebellious". 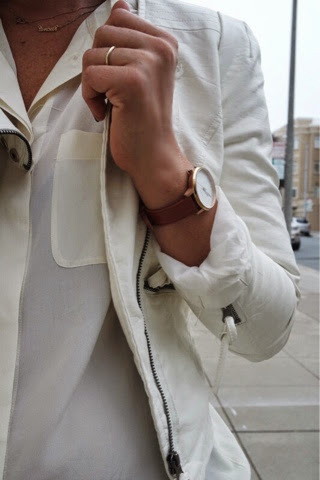 Yes, I do love a good black moto, but white hits all the high notes (neutral color, matches everything) without making me look like an occasional extra from Grease 2. Fall comes around and all I want is my rose gold and cognac leather Nixon watch. The big white face and classic band just pull everything together. Paired with some fall perfect booties (can't go wrong with the classic Sam Edelman Petty Booties) and you're ready to frolic through the fall foliage. That's really all it takes to transform summer staples like a white, sleeveless silk blouse, into the perfect fall outfit.